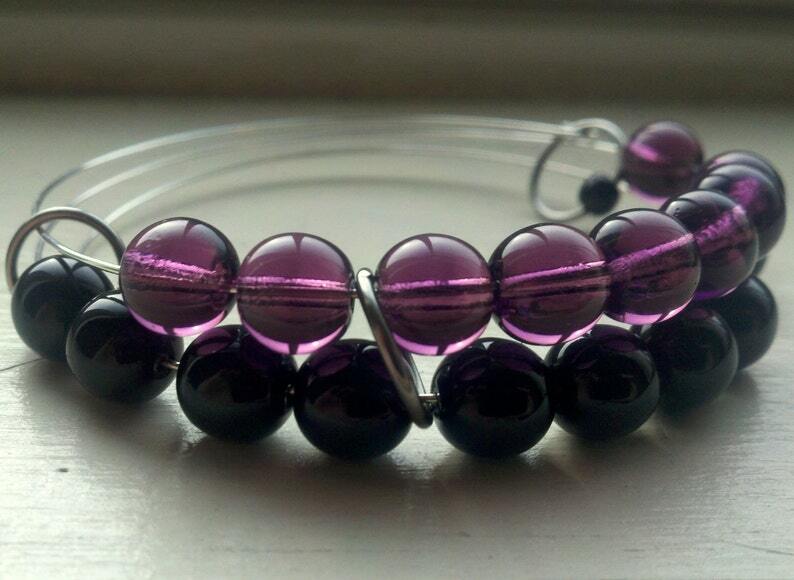 This eye-catching purple and black beaded bangle looks too pretty to be useful, but it has a secret - it's actually an abacus! Use it to remember a number, count rows in your knitting or crochet, or do basic math with numbers up to 99. Comes with complete instructions for use. The silver-colored memory wire allows it to expand and contract to fit just about any wrist, and the glass beads and steel end hoop catch the light as you move. Check out coordinating accessories in my Etsy shop, including similar bracelets, matching earrings, and matching stitch markers! See something you like, but you'd like it different, or you'd like more than one? See something I've sold and want a similar one? Want something completely different that I could make? Go ahead and ask, I do custom orders for accessories. Because of the nature of hand-made items, there may be small variations between the item you buy and the one in the picture. Note that different monitors display colors slightly differently.